Andres Zamorano (fourth from left) walked away with the Shake, Sparkle & Stir trophy and more. Andres Zamorano, a bartender for TGI Friday’s, last week won the fifth annual Shake, Sparkle & Stir competition, sponsored by The Coca-Cola Company, with his variation on the Aperol Spritz. 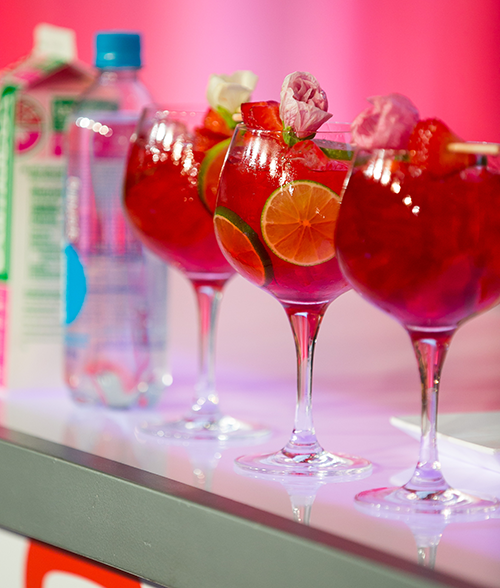 For his Flower Power Spritz (left), Zamorano combined two Coke products — Smartwater Sparkling and Strawberry Hibiscus Barrilitos Agua Fresca — with the Italian liqueur Aperol, Prosecco, lime juice, sliced strawberry and lime wheels. He stirred the ingredients together in a balloon wine glass, added ice, gave them another quick stir and garnished the drink with a lime wheel, a strawberry and an edible hibiscus flower. He was awarded an all-expenses-paid trip for two to New Orleans to attend the liquor-oriented conference Tales of the Cocktail in August 2019. “The cocktail combines the comfortable and approachable flavors of strawberry with the adventurous twist of floral hibiscus,” Zamorano said in his description of the drink. First runner-up was Caleb Grose, food and beverage optimization and innovations manager for Red Robin Gourmet Burgers and Brews, whose Fresa Fresca also used Smartwater Sparkling and Strawberry Hibiscus Barrilitos, as well as another Coke product, Minute Maid Lemonade. He made the Barrilitos into a simple syrup and shook that with the lemonade along with Hendrick’s Gin, St. Germain Elderflower Liqueur and lemon juice. He topped it with the Smartwater and garnished it with a strawberry and a mint sprig. All contestants were required to use a Barrilitos product as well as at least one other Coke product. The competition was judged by Nancy Kruse, president of The Kruse Company; Lacey Lauderdale, beverage manager of Walk-On’s Bistreaux & Bar; and Bret Thorn, senior food and beverage editor of Nation’s Restaurant News.